Thurs. Feb. 27, 2014….Great day today in freezing cold temps, didn’t get above 30F for much of the day and it was very windy. Guided John Pratt and we caught around 20 to 25 trophy rainbows …..a number of them way over 20" and the largest that was about 10.5lbs. We caught fish on a variety of nymph patterns and the largest ones ate either one of my Dead Squirrel patterns or a new fly I call an Rx nymph. It was good fishing despite the bitter cold and fishing most of the day with ice in the guides. 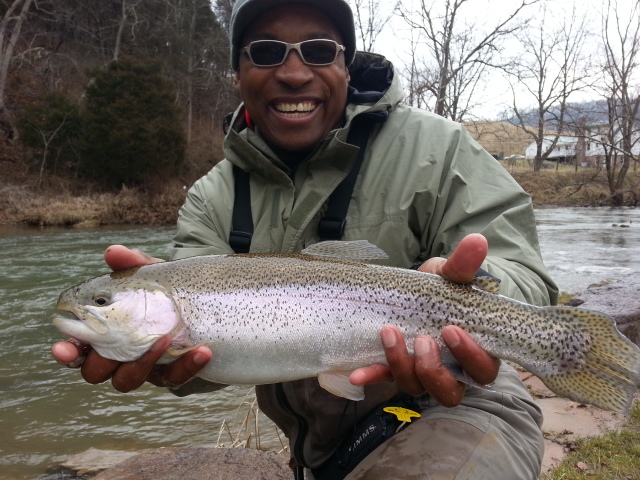 Have another trip tomorrow guiding Shaun Redgate, Forest, VA. Should be another great day. Thurs. 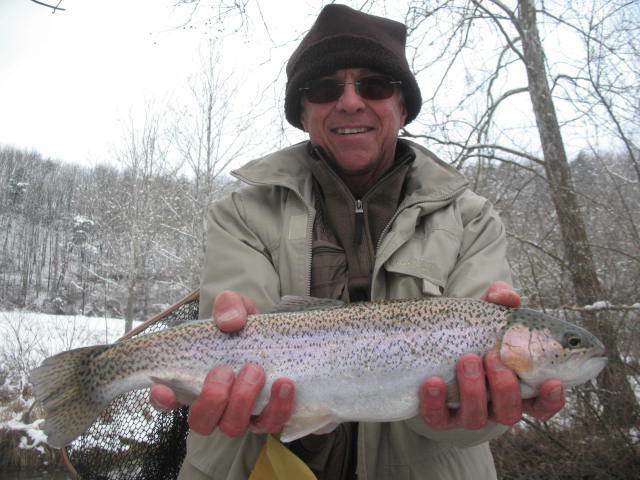 Feb 27, 2014…..Out bright and early this morning, guiding John Pratt on the Big Cedar Fork of the Clinch today and we will be fishing for some trophy rainbows. Hard to believe it’s almost March….it’s cold. Real cold. We are going to start about an hour later and look forward to a good day. There’s a little snow where we are headed. I love it but am ready for Spring! Have a great one and more to come…. Wed. Feb. 19, 2014…….Looks like after a lot of cold and snow we have heavy rain and thunderstorms. Not a good mix with tons of snow still lying around. We won’t have much time before things get dicey……or muddy rather. Guiding Robbie Willard today and will be looking forward to putting some in the net. Good Day Ended Up a Great Day…..
Tues….Feb. 18, 2014…. Hard to believe a week ago we were pounded with cold, snow, and ice…..feet of snow depending on your location. And today it is supposed to hit 60F…..and be that way through Friday. Incredible. 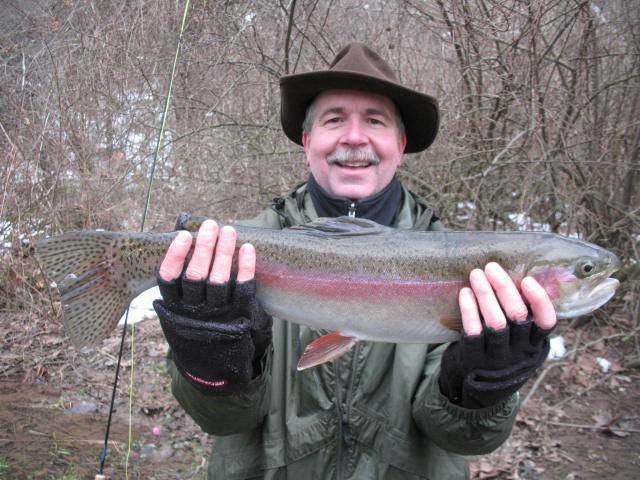 A lot of melting snow though, and the creeks and streams not controlled by a dam will be mighty chilly….don’t expect much in the way of early am fishing . At least don’t be surprised if the fishing is slow to nonexistent. Guess what that is? Normal. When snow melts and runs off the water in the stream will be near freezing. Fish are lethargic when its like that. Will they still feed? Yes. Its just that instead of early am it might be early afternoon before they ‘wake ‘ up. So plan your fishing accordingly. Here’s a recap of yesterday’s trip…. Got a mid morning start due to very cold temps and ice in the river. Guiding Ron Davis and his son Robert from Winston-Salem, NC, and we have done very well nymphing. Landed 20 fish so far on a variety of double nymph rigs. 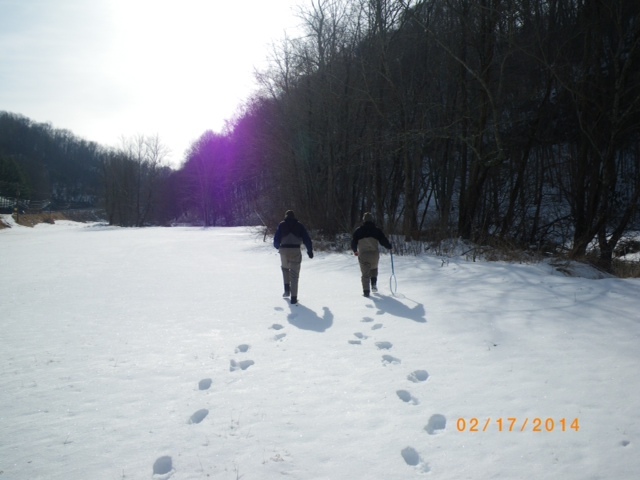 About six inches to a foot of snow still lying around and drifts to a couple of feet in places…..Lots of ice floating in the river and that made for challenging fishing at first. We had ice in our guides, and plowing through 2 ft drifts in spots to get to the river. We fished a couple of stretches and then had a hot lunch and then hit a few more spots. The afternoon was good too, and Robert ended up with 32 fish ……I think we landed about 45 fish total, a mix of browns, rainbows , and even a few brookies…. so it was a good day. 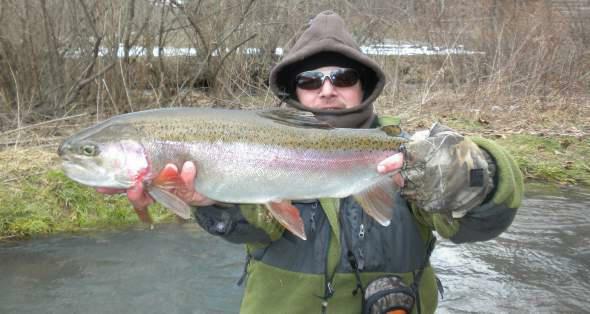 Good Flows, great nymphing conditions, fish are in slowest areas of stream or at least they were where we fished. That is a normal thing for when you have snow and ice and lots of really chilly water going into the stream. We had sunny skies then it clouded up. The word from weather folks was more snow this afternoon and evening…….but it ended up being a freezing rain event. Little impact though, at least not like the past week. Temps will be moderating to the upper 60s here and high 50sF to low 60sF in the hills. I have another trip tomorrow guiding Robbie Willard, Kernersville, NC, and we’ll be doing a half day trip and I expect us to do well if the snow hasn’t melted a lot and bumped up stream flows. 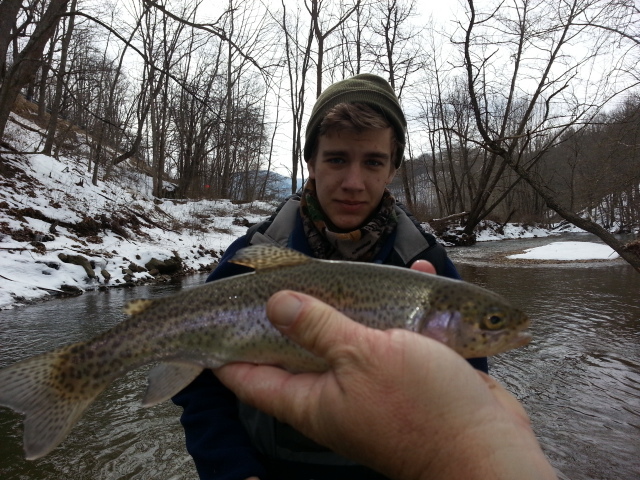 Good Day of Fishing in the Snow…..
Mon. Feb. 17, 2014……Got a mid morning start due to very cold temps and ice in the river. Guiding Ron and Robert Davis from Winston-Salem, NC, and we have done very well nymphing. Landed 20 fish so far on a variety of double nymph rigs. 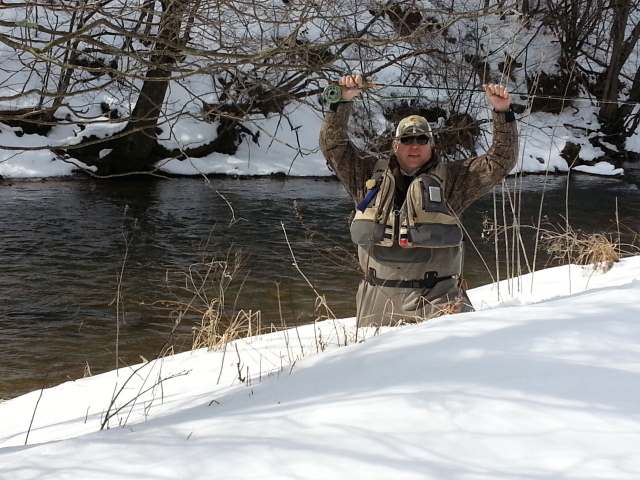 Lots of ice floating in the river, ice in our guides, and plowing through 2 ft drifts in spots to get to the river. We are having a hot lunch and then hitting a few more spots. Looks like more snow this afternoon and evening…….hopefully this one is light. Mon. Feb. 17, 2014…..Great day, snowy and cold guiding Ron and Robert Davis today and looking forward to a great day. Looks like a good day, water is in great shape…. Pre – Winter Storm Fishing…. 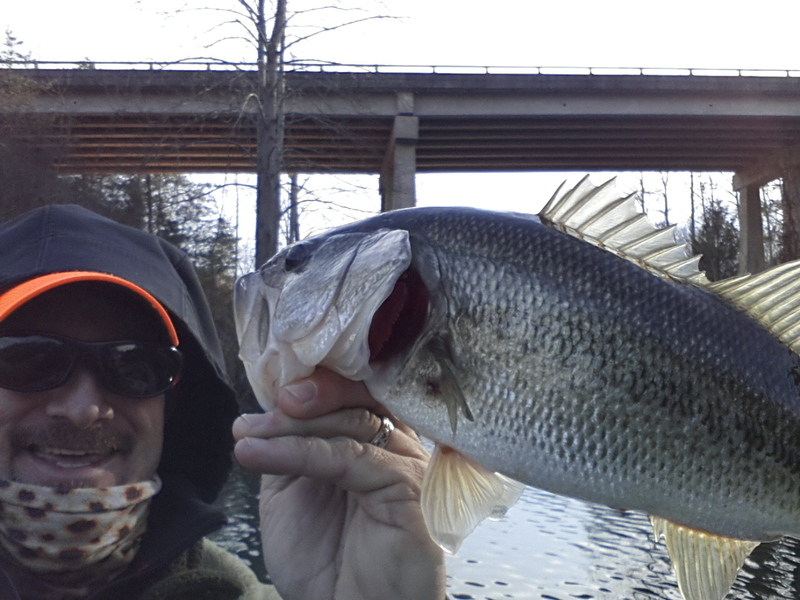 Tues. Feb. 11, 2014……Took a few hours this afternoon to try out some new stuff and go for some schooling bass I have been following for several days. The fish were right where I expected them to be doing just what I expected them to be doing. These school largemouth were running bait balls of shad to the surface. For 3 hours I cast to fish busting bait pods and once I got the size of the fly right it was game on. Caught several including one that was about 4lbs. They took my 1.5" shad zonker. 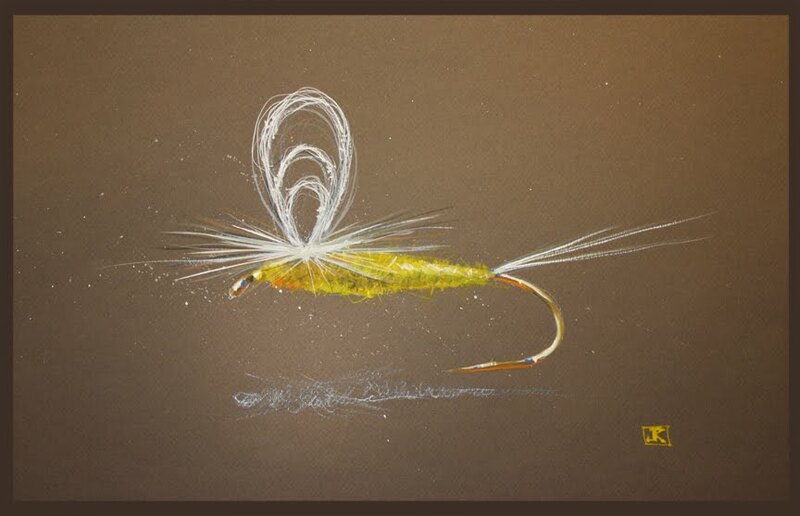 It was great, will be heading to the vise tonight to tie some more of those patterns. Looks like a major winter storm with up to a foot of snow could be headed our way. I plan on fishing these bass over the next several days until my next lesson on Thursday and next guided trip on Monday. 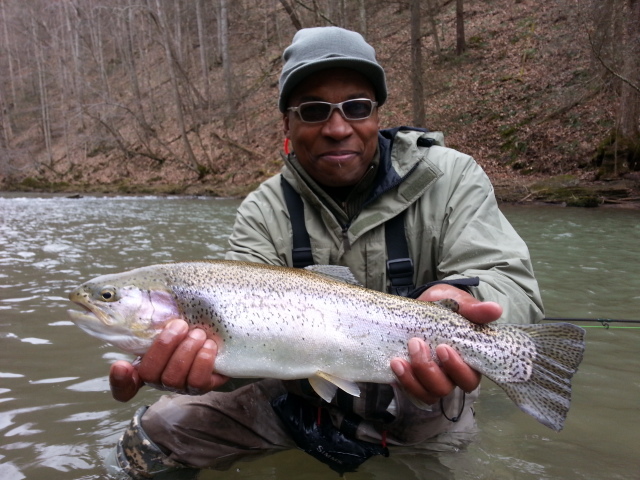 No End to Winter in Sight…..Also No End to Good Fishing ….! Mon. Feb 10, 2014…….Snow, cold….those are becoming dirty words to more and more people. But the water here is in great shape despite it all…..had some good days the past two weeks, both on tailwaters and on smaller waters too. 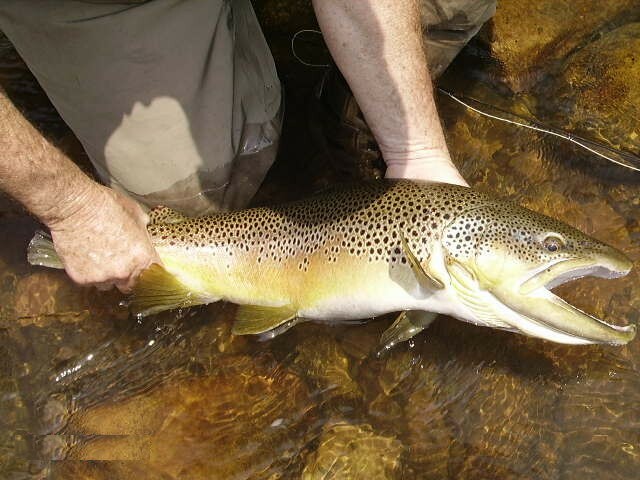 Had some epic fishing with Dr. Jim Kramer with some large SoHo browns…..never get enough of that. This past Saturday, Feb. 8, 2014, I guided my longtime client and friend Duane Bryant, Greensboro, NC, on the Big Cedar Fork of the Clinch in Russell County, VA, and we had a pretty good day …snowed on our way up, snowed half the day, and it was pretty chilly …..never got out of the 30sF. 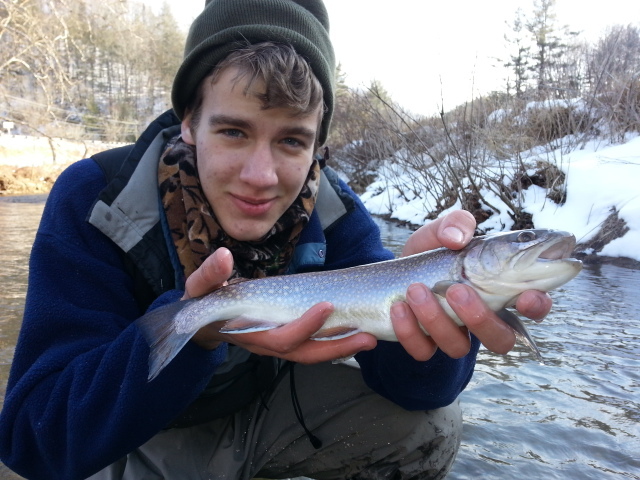 We nymphed and streamer fished and did pretty well, landing a good many fish and probably a half dozen fish over 22″, several fish were in the 25″ range and probably 6lbs. Threw some new articulated streamer flies, and some new nymphs and did well on the new stuff. 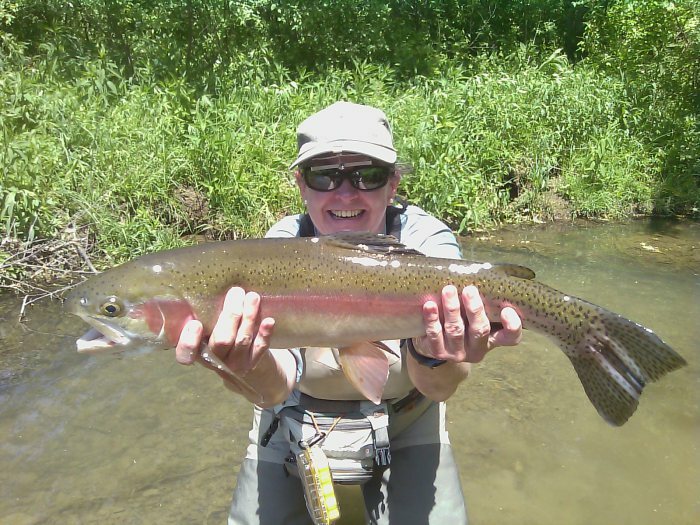 At times we were throwing some streamers that were 8 inch long articulated beasts…..ever through an 8 inch fly for trout…..We did it…..all day long. Moved some beasts and one of the most heart stopping thumps in the world is when you see one of those giants chase down a big fly like that and kill it. Its the stuff dreams are made of….Duane and I enjoyed that often on Saturday. 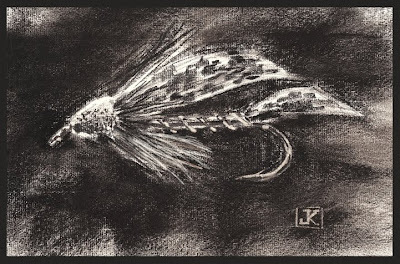 Great monday to you,looks like we are bracing for yet another snowstorm…….up to 6 inches here and more in the hills…..Here’s the presumed track of the storm….Fishing is good in the snow……..if you’ve been with me when its like that you already know that. Not good, usually great. 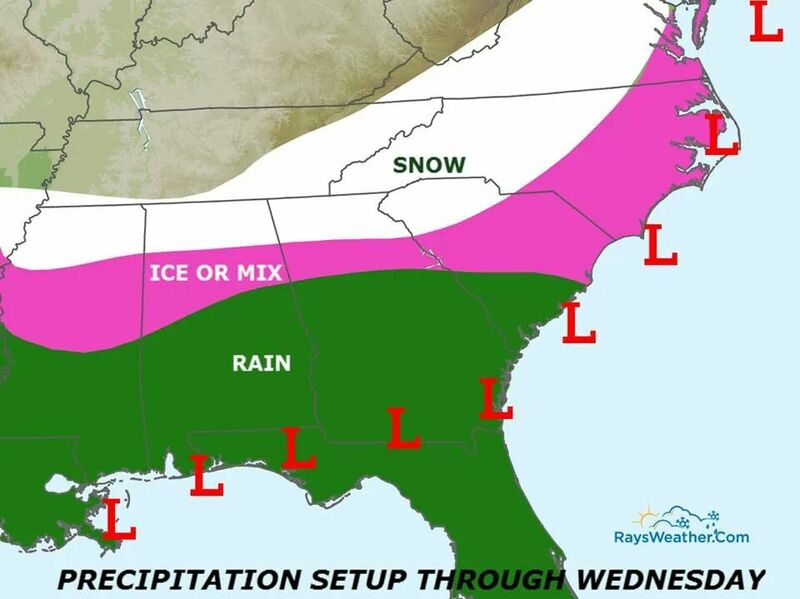 We have a snowfilled week coming up, and this type of weather setup is the way we get our biggest snows. I’ll leave it at that.Fishing is good right now, most places have now thawed and water levels are great. To have a little high (clear) water this time of year is good for us if you love to fly fish, that means good water levels for spring. 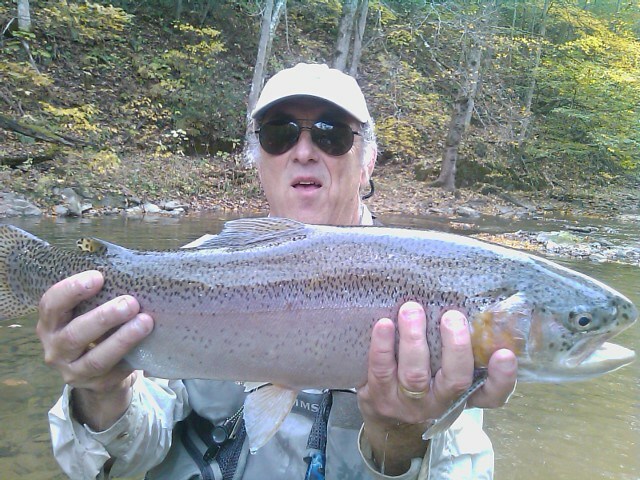 We have several waters that are fishing good right now, if you want to catch some bigs……..two tribs to the Clinch River I have some private access to, the Little River and the other is Big Cedar Fork. A third stream is Wolf Creek just north of Big Walker Mountain in Central Virginia. Two of these waters aren’t frozen up and haven’t frozen and won’t freeze even in coldest of weather. 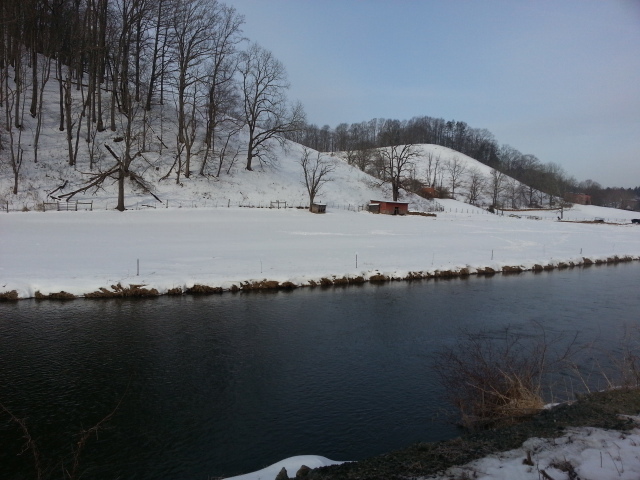 Wolf Creek does occasionally, but its now ice free. Normally these trips are $295 as its a trophy opportunity but I am making available a spring special and that is take $60 off or $235 to fish a true trophy water with huge fish….again the Feb. trip special is $235.00. Here are some pics of past trips here …. A great day to ya……going to crank out some flies while I watch it snow, catch up on some messages, and finish up some stuff around here so I can go drop the boat in the water and float the South Holston and look up some of those big browns I’ve been talking with lately….. 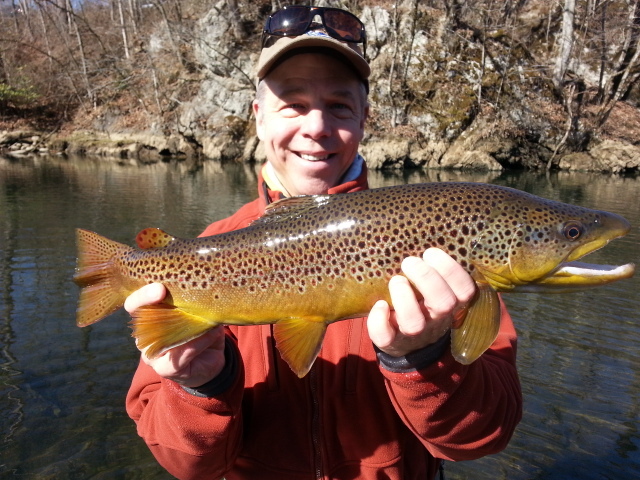 Huge South Holston brown landed by my client Tom Wright…..this fish was between 12 and 13lbs……a beast by anyone’s standard…..
Great Morning on the SoHo. .. Sat . Feb 1, 2014….Arrived to an icy, chilly river and air temps lo 20sF but it didn’t take long to get into fish……landed 30 or so on a variety of nymph patterns. Guiding Dr Jim Kramer and he landed 3 20 inch plus browns including one 26 1/2" beast of a brown in addition to the fish above. Game on…..Headed to another spot….More to come….